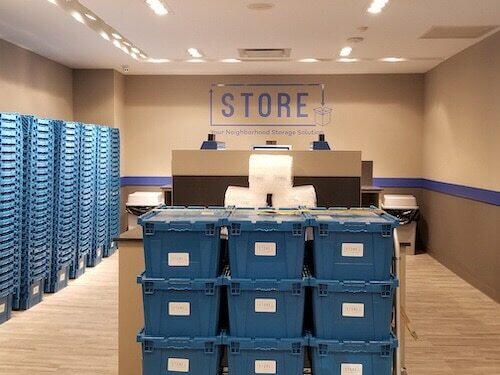 With STORE, the days of spending long hours waiting for storage professionals to pick up your items or going far out of your way to unload your items at a facility and place them in storage yourself are over. We do not require you to sign a long-term storage contract. You simply pay for public storage per item, on a month-to-month basis. We handle the storage work for you. Do storage like you never have before at our convenient relocation in the Upper East Side of NYC. We are located at 1290 3rd Ave at the corner of 74th St. All you have to do is drop off your stuff with us. From there, we handle your items with care and place them in secure storage. At our location you can simply choose the containers you want for your items and follow the directions on our kiosk to place your items into storage. We handle the rest! The drop-off and pickup process is smooth and efﬁcient every time due to the work of our professional team and easy to use software. At STORE we provide you with ﬂexible options and beneﬁts, including our valet pickup and delivery services, single item storage, and our prime retail location in NYC. Our top priority is the security of the items you place into our hands for storage. Our staff ensures that your belongings are secure in a self-storage center equipped with state-of-the-art climate control, key code accessibility, and 24-hour video surveillance. For additional information about the secure and affordable public storage solution we offer in NYC, give us a call today at 212.249.8000 or leave us a message through our contact form.